Hillary Diane Rodham Clinton (born October 26, 1947) began her legal career as a children's advocate in Arkansas, which led her to a prestigious (and glass-ceiling-smashing) legal career at the Rose Law Firm. 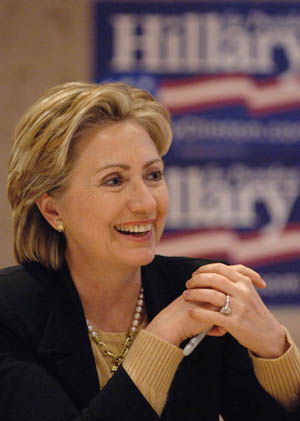 Said legal career eventually led her to serve as Senator from New York, run for President (twice), and be co-opted for the Administration of the first guy who beat her — Barack Obama — as Secretary of State, a role in which she visited 112 countries in four years and which has seen her widely regarded by many as one of the best modern Secretaries of State ever to hold the position. For eight years she was First Lady of the United States, being without question the most politically active First Lady in American history, handily beating out even Eleanor Roosevelt. A graduate of Wellesley College and Yale Law School, Clinton spent years working as a lawyer, specializing in child services and welfare. She met Bill Clinton when both were students at Yale Law School and married him in 1975. By the time her husband ran for Governor of Arkansas, she was already well known as a lawyer and politician in her own right and had come to national attention as the first student ever to give the commencement address at well-respected Wellesley College, her alma mater, and as the first-ever female partner at Arkansas' prestigious Rose Law Firm. She actually pulls in more money than Bill (through her Clinton Foundation), and has consistently shown to be wearing 'the pants' in the family. She was a highly controversial First Lady, making health care reform her pet project and attracting attention for her hands-on approach. The moniker "Billary" and the "two-for-one" jokes may have been funny, but they also held more than a grain of truth, and the contrast was even more marked after the distinctly hands-off, stay-at-home policies of then-recent First Ladies such as Barbara Bush and Nancy Reagan. Her tenure as First Lady, however, was only the beginning for Clinton. She became the first First Lady to hold political office in her own right when she took her oath as Senator (D-NY) in early 2001, just months before the devastating attacks on the World Trade Center. Obviously, as New York's junior Senator, in the immediate aftermath of 9/11 she was instrumental in shaping America's response to the attacks. Later on during her time in the Senate she campaigned further for health care as well as speaking up for rural areas such as upstate New York and the areas around Albany and Syracuse. She won again by a significant margin in 2006, but left the Senate to engage in the closest primary election in American history, the 2008 Presidential Democratic primary. Up against Barack Obama, she won over 18 million votes around the country and was the first serious female candidate for the Presidency in history. She fought the campaign out right up to the Democratic National Convention, but spoke in favor of her former rival as its keynote speaker on its second night. Since Defeat Means Friendship, she joined Obama's cabinet as Secretary of Statenote after initially refusing the post, in fact — Obama told her rather bluntly that he quite desperately needed her talents in the position, which helped build trust between them, becoming the first spouse of a former president to serve on the Cabinet and the third woman to serve as head of the State Departmentnote after Madeleine Albright and Condoleezza Rice, and has used her many foreign contacts from her days as First Lady to assist in restoring America's image around the globe. She chose not to remain in the post for Obama's second term, passing that baton to now-former Senator John Kerry. Though she refused to say 'yes' to whether or not she would run again in 2016, she also, quite notably, refused to say 'no'. She also hinted that she might write another book, which was later confirmed ; a second memoir called Hard Choices, covering her time as Secretary of State was released in June of 2014. In April 2015, the speculation was confirmed when she finally announced her candidacy for President in the 2016 election. On July 26, 2016, she became the Democratic Party's nominee for President, adding yet another 'first' to her very long list as she became the first woman to be officially nominated by a major party for President of the United States. On November 8th, 2016, despite winning the popular vote, she lost the electoral college vote and thus the presidency to Donald Trump. Although several different biographies of her have been written, she has also written her own autobiographies, Living History (2003), Hard Choices (2014), and What Happened (2017), her personal account of the 2016 Presidential Election. Clinton's policies, image, and general existence are highly controversial and as with all things political, kindly follow the Rule of Cautious Editing Judgment. She goes by the name Hilldog in South Park. In The Snuke, her supporters wear dog masks, and she speaks with a heavy Dixie accent. In 2008, the real Hilldog imitated the accent to southern voters, and in 2016 she imitated a dog to mock Republicans. She goes by the name Hillary Easton in Choujin Sensen and is currently trying to solve the mystery of [FEE] as the 45th President of the U.S.A.
Susan Stanton in the Roman à Clef novel Primary Colors is based on her. In the film adaptation, she's played by Emma Thompson. In the film The Special Relationship (broadcast on HBO in 2010), she's played by Hope Davis. The film is about the relationship between Bill Clinton and Tony Blair. She was parodied in several Saturday Night Live sketches. She was played by Amy Poehler in the most famous one, where Tina Fey played Sarah Palin. She was also portrayed by Jan Hooks, Ana Gasteyer, Vanessa Bayer and prominently during the 2016 campaign, Kate McKinnon. Elaine Barrish Hammond (Sigourney Weaver) in the 2012 miniseries Political Animals is partially based on Clinton: she's a former First Lady who unsuccessfully campaigned for the Democratic nomination for President, and became the Secretary of State in the winner's administration. In the backstory for the Axis of Time series, the 21st-century aircraft carrier USS Hillary Clinton is named after "the most uncompromising wartime president in the history of the United States". The fanfic And All the Stars Burned Bright, a Star Trek crossover, name-dropped the USS Hillary Clinton as a President-class starship, thus implying that her then-speculative 2016 bid was successful; the fic was published in 2011, almost exactly four years before that bid became a reality. In Stephen King's novel 11/22/63, she becomes President in 2004 in an alternate timeline that results from a time traveler preventing the Kennedy assassination. In a first-season episode of Sliders, she is the President in an alternate universe where women are the dominant gender. She is a constant background presence in HBO's Game Change, though never appears directly. She is heavily implied to be Will McAvoy's contact at the State Department in The Newsroom, particularly as, when Will says he can't get hold of his contact there, another character tells him to call "her husband".